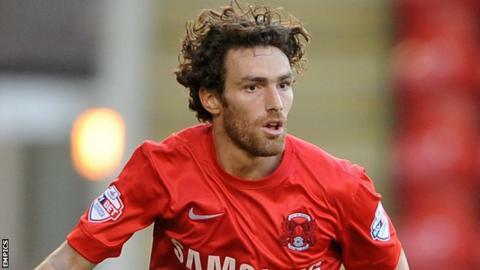 Leyton Orient midfielder Romain Vincelot has been given a one-match ban for deliberately picking up a yellow card in order to trigger a suspension. The Football Association found him guilty of purposefully being cautioned against Southport in the FA Cup last week to register his fifth booking this term, and he was also fined £1,500. The booking meant the 28-year-old missed Tuesday's Johnstone's Paint Trophy fixture against Stevenage. Orient will not contest the decision. The former Dagenham & Redbridge, Brighton and Gillingham player's suspension begins with immediate effect, meaning he will miss Saturday's League One fixture against Preston North End. Players collecting five cautions between the start of the season and the end of December are automatically suspended for one first-team game, but Vincelot's booking against Southport meant he did not miss a league match. The FA brought the charge "on the basis that his conduct was an attempt to undermine the purpose of the disciplinary process". Russell Slade's Leyton Orient are currently top of League One, two points clear of second-placed Wolves.